Kind of reminds me of the mailboxes from Fallout: New Vegas. Clever idea and nice way to implement it. It might also be more intuitive to add else clauses showing notifications for not enough gold or below minimum weight. Wow thanks for taking the time to go through it. I added the configuration as an afterthought and must have forgotten to adjust the script. I'm definitely putting in those notifications, they're needed. I'll also make the weight limit configurable. Won't forget to tweak the script this time. Thanks again. Brilliant idea!!! So bloody sick of carting around all my sh*t to take back to the Safehouse in Solitude. Now if there were only a porter who would carry the goods to my front door . . . . 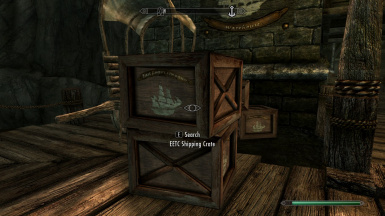 I've found the crate in Markarth, placed a dagger and tried to sneak-activate to send it to Whiterun for testing,........but I can't sneak-activate. All I get is a "click". Ah, okay then. I'll try it again with some heavy stuff. Works like a charm! 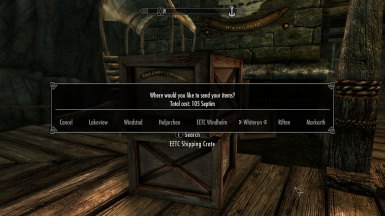 Sent my stuff to Solitude as this is my current stop and I'll try to send stuff to other crates and from there as I find them to the central hub in Whiterun, see if it all arrives in one piece. Simple, straightforward and transformational. Clearly gives more detail to immersion. Vaguely reminds me of the mod "Googles Resource Exchange." The imagination reels with possibilities. Neat! I've been looking for something like this for SSE since it's release! Thanks for sharing.